WHY JEWISH MEDIA PUSH FOR RACE-MIXING? So-called “activists” see NO problem if in the next 2 or 3 decades native Whites (Ethnic Europeans) become a minority in ALL their homelands, and if later, maybe in 50-60 years they become 10% or even disappear from earth in a 100 years as an ethnicity and culture.Why people oppose such plan if it will happen to a tribe in Tibet, or the tribes of Amazon, or tribes of Africa. I tell you why: It is because they are MARXIST, and they don’t know even. They are brainwashed by the JEWISH media & education who want us to believe that all Humans are one race, but “with different skin colors”, exactly equals and INTERCHANGEABLE. They want us to believe that exchanging White people (Europeans Caucasians, Aryans and Slaves) by people from the 3rd world races is not a problem. As if replacing a German shepherd dog population by “Chien de Salon” dog population will preserve the identity and behavior of that population. Or if you replace a population of Arabian horses by a population of Dutch Horses, then nothing changes on the behavior & abilities such as running or intelligence of that population. Marxists DON’T deny the existence of different races when it concerns dogs, horses or birds. WHY THEY DENY IT FOR HUMANS?? Denial means that NOTHING can stop the ongoing GENOCIDE (replacement) of White people in their own homelands! Why people don’t admit that non-Whites and mixed race people are on the way of becoming a MAJORITY in all previously-known White countries?? This century will witness the complete GENOCIDE of the European people living in Europe, America, Australia, Canada, unless people understand the IMPORTANCE OF RACE: As with animals, each race has its average of IQ (or intelligence). It doesn’t mean that there are no individuals from a population that has a lower AVERAGE of IQ, who have higher IQ than individuals who belong to a population that has higher average of IQ. You got it? We are talking about populations here, not individuals! The average of IQ of different ethnicities determines the average of development of countries. THIS IS WHY we have advanced countries that produce too much for humanity, and less advanced countries that produce less. This affects the prosperity, the security, and the quality of life in different countries. RELATED MEMES – PLEASE SHARE FAR AND WIDE ! I wish all Whites speak the same. If they do we can avoid the biggest plan of the Jews that is called “One world Government” that requires the Genocide of the Whites and the creation of mulato new race. Jews have identified as “White” in order to infiltrate, take over, and subvert White Western civilization. 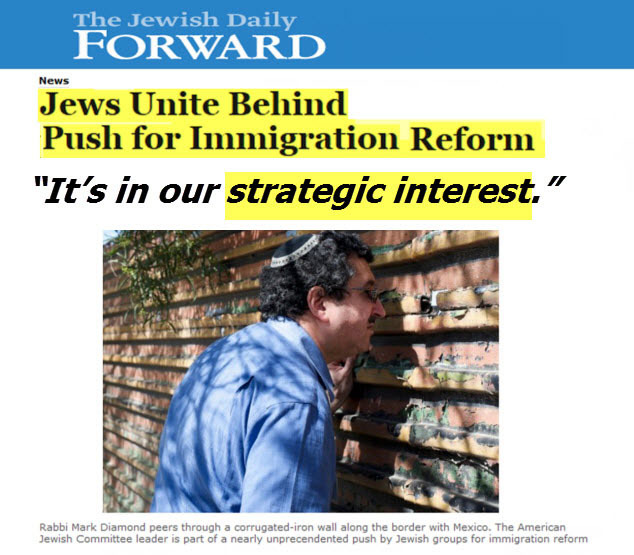 However, now that they have achieved incredible power and used government, media, and academia to wage an all-out assault against White people, top jewish leaders are now telling jews to abandon “Whiteness” in order to join in the fight against “racism”. According to them, race is just a social construct, so there really is no issue with jews choosing to be White one day and an oppressed minority (that controls almost everything) the next. 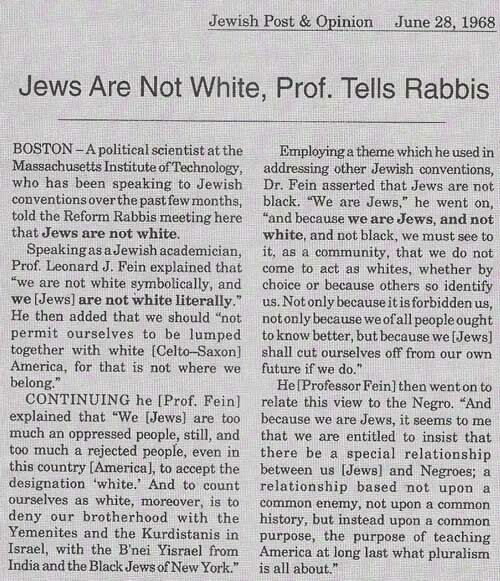 Jews in America struggled for decades to become white. Now we must give up whiteness to fight racism. You should really read the whole article, but here’s a short excerpt for your consideration. In a flawed and racist society, we Jewish Americans are prospering, reaching the top echelons of privilege and power. With racism and injustice entrenched year after year, generation after generation, we must now ask ourselves: What role do we play in that injustice now that most of us live as white people in America? We must cease to consider ourselves to be part of the social construct of whiteness, despite all the white privilege that America affords us, privilege that eluded many of our parents and grandparents. Starting in this new year of 5776, we must teach our children that we are, in fact, not white, but simply Jewish. 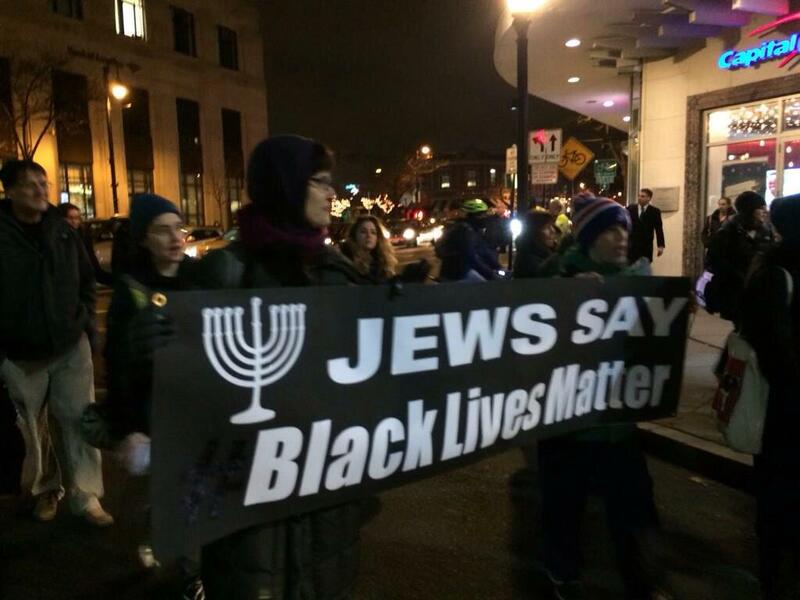 For centuries jews have flip-flopped back and forth, only being White when it suits them. They like to hide behind “Whiteness” in America when their people commit massive crimes, from the recent Wall Street scams that cost us trillions of dollars all the way back to the trans-Atlantic slave trade, which they dominated. Since jews control our media, you will only see TV shows, movies, books, and articles with an Aryan man whipping his negroes, not the hook-nosed merchant who was the real oppressor, who also enslaved Whites. Jews also like to claim to be White when they are trying to make real Whites feel guilty for their “White privilege” or when encouraging violence against evil Whitey. 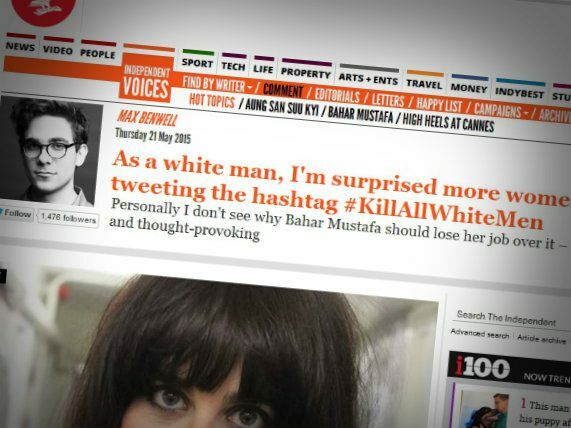 A recent example of this was seen when writer Max Benwell supported Bahar Mustafa’s hashtag #KillAllWhiteMen from the perspective of a “White man”, even though he has also written articles about how he’s a jewish man. Of course it wouldn’t look very good for the jewish cause if he had written “As a jewish man… #KillAllWhiteMen”. It would make the genocidal game a little too obvious. 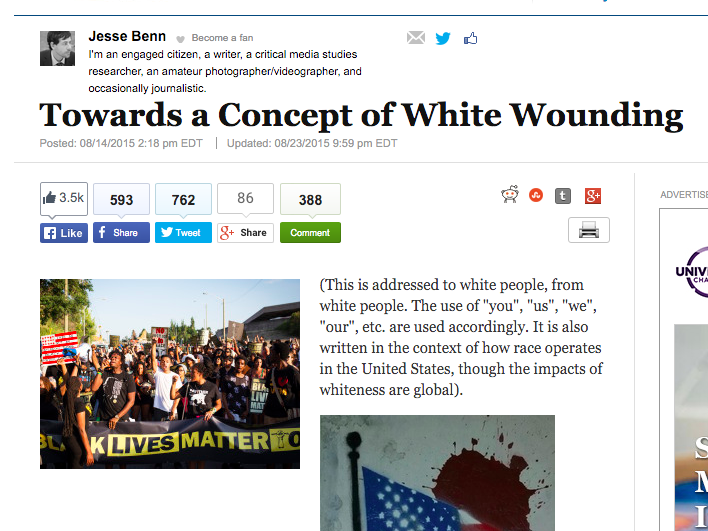 A similar incident happened recently when Jesse Benn, a jewish author at the Huffington Post, wrote as a White person that we need “White wounding”. 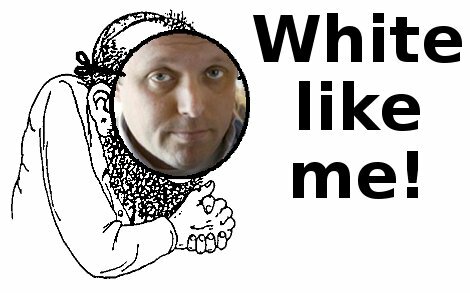 Another good example is the anti-racist anti-White author Tim Wise, who makes loads of shekels talking about White privilege and racism, under the guise that he himself is a White man, even though he is a jew. He even wrote a book titled White Like Me! This is similar to the case of Noel Ignatiev, the retired professor who makes it clear that he wants to abolish the White race. He is the publisher of Race Traitor Magazine, but if this jew was actually being a traitor, he would be calling for the extermination of the jewish race. Therefore, he is not a race traitor, but yet another a jew pushing White genocide. Now let’s take a brief look at how jews work to ingratiate themselves to other “minorities” by distancing themselves from “Whiteness”. As many people already know, the NAACP was founded and run by jews for decades. 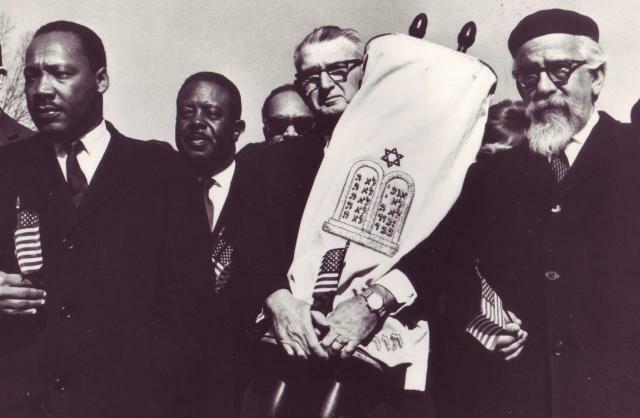 Jews guided Blacks during the entire “Civil Rights” struggle in order to disenfranchise and destroy White Americans. Their claims of not being White are nothing new either. A Times of Israel article from 2014 echoed these sentiments as well, signalling to jews that it is time to jump ship. Now that White genocide is in full swing, they are also signalling to non-Whites that jews are totally on their side in their struggle against Whitey. 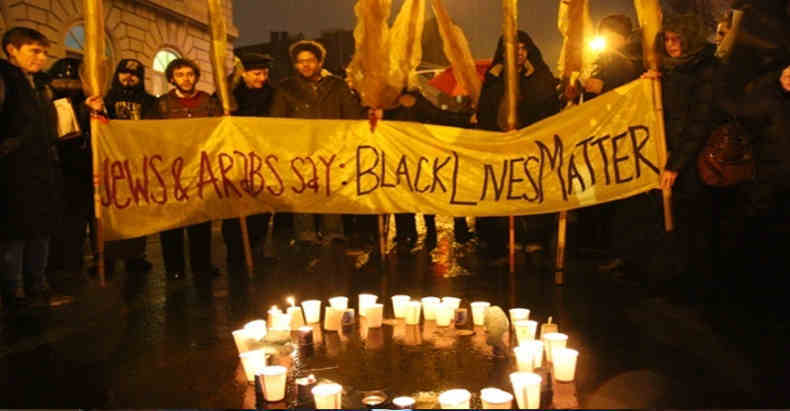 After the justified killing of a violent Black who assaulted a White policeman, rabbis converged on Ferguson to show their solidarity with the Black community, who ended up looting and burning the city. 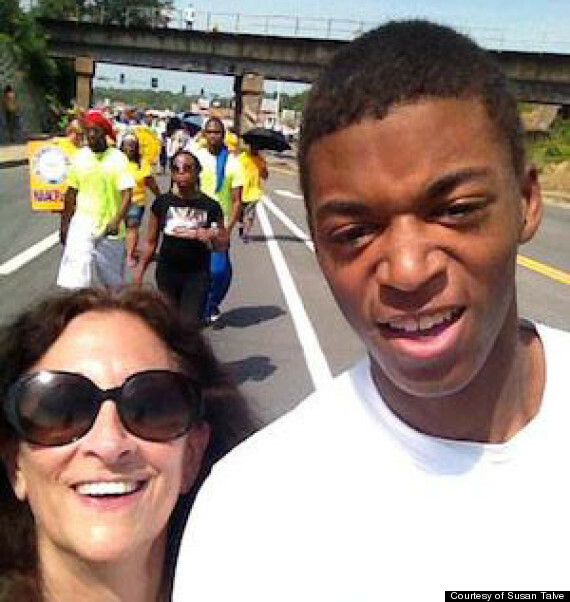 Here’s one such rabbi marching side by side with a “youth”. 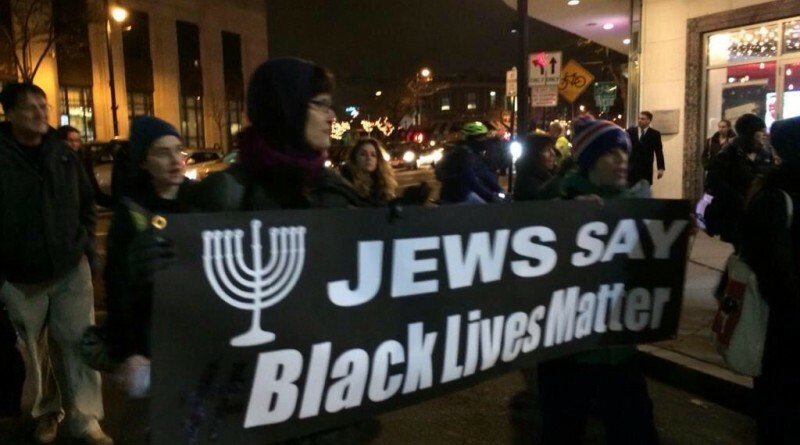 Jews say “Black Lives Matter” in America, but don’t hold your breath to ever see such banners in Israel, which is perhaps the most “racist” country in the world. Still, they are somehow able to convince many “minorities” that they really are noble-hearted social justice warriors, in order to form a massive coalition (which includes many Whites) intent on dismantling any vestiges of White civilization. So who or what are these jews really? Jews overall are a mixed race, which still maintains a strong identity, able to blend into a number of different ethnicities for strategic purposes. 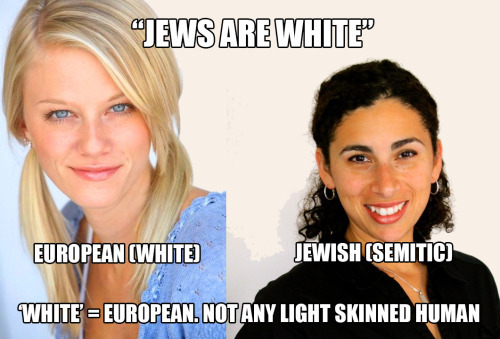 Yes, there are some jews who have light skin, but jews are not White! The brilliance of being Jewish, though, is that we stubbornly refuse to fit into any social construct of power or oppression. We are simply Ivri’im, people from “somewhere else,” people who struggle with God and justice, who demand that the rest of the world does, too, and see every human life as sacred because we are all in the image of God. And the truth is, we have never belonged to one race alone. The Torah tells us that we left Egypt with the “erev rav,” with a mixed multitude of peoples. Around the world there are Jews of color, Asian Jews, Jews of all kinds. 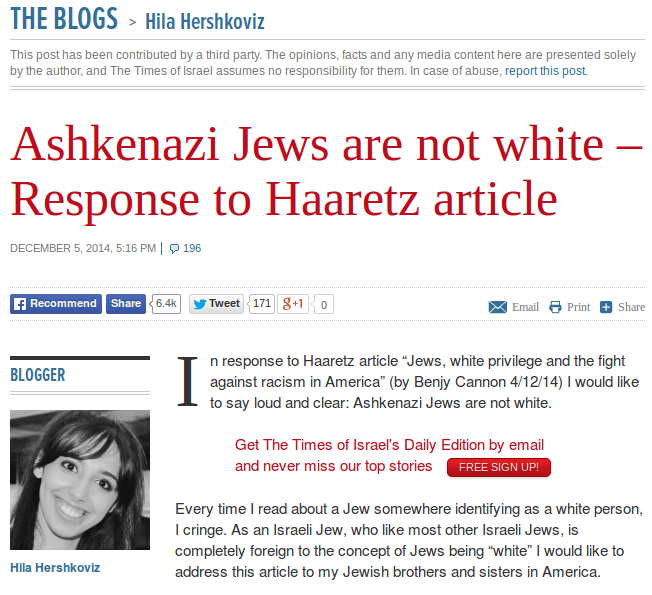 The idea that Jews are white is not only ridiculous, it’s offensive to who we really are! So with that last sentence in mind, I would like to ask Jared Taylor whether or not he still thinks jews are White. I would also like to confront Thom Hartmann about this subject, as he ridiculed me on air for saying that jews are not White. Thom was being offensive to jews by calling them White! This cable TV interview came out well before the Times of Israel and Washington Post articles, so I hope I was able to help force this issue so we could get some clarification. Let’s not allow jews to play their crypsis game. They need to be clearly identified. Yes, Juden, we’ve figured out what you’re doing and we’re not going to allow it to continue unchecked.